Apple's MOV format is a multimedia container format mainly used by QuickTime. MOV is great when working with Apple iPhone, iPad, QuikTime Player, but if you plan to run MOV files on Windows-based applications like Windows Media Player, Windows Movie Maker, Windows/Android devices, you have to convert QuickTime MOV file to WMV, MP4 etc. format accepted by Windows System and Android. We've discussed how to convert MOV to MP4 and this tutorial will guide you through the basic steps of converting MOV to WMV on macOS and Windows with the best MOV to WMV converter for macOS. There is more than one way to convert MOV to WMV, for example, you can free convert MOV to WMV online with very limited file size. We recommend using desktop MOV to WMV converter, MacX Video Converter Pro, which is a leading video converter popular for its blazing fast speed and high quality. The tool lets you convert multiple QuickTime MOV files to WMV in batch without file size limits, with at least 5x faster speed than others and nearly original quality output, thanks to the Hyper-threading, Intel QSV tech, Multi-core CPU processing, and High-quality Engine. Below is how to free convert MOV to WMV on Mac and Windows. The MOV to WMV converting software comes with a very user-friendly interface, it's easy to learn how to begin. Download the program for macOS (macOS Sierra/El Capitan or earlier) or Windows version (Win 10 or older). No worries about hidden software or adware during the installation process - it's clean, no ads, no plugin, no adware. Afterward, launch the MOV to WMV converter on your computer. Step 1: Click "Add Video" tab in the upper-left corner and select MOV files you'd like to convert to WMV. Alternatively, you can directly drag and drop the source file. An Output Profile window will appear as soon as the file is loaded. Step 2: Click "PC General Video" and select "WMV Video" from the resulting formats. Step 4: Then hit "RUN" button at the bottom of the window to start processing MOV to WMV conversion with the best video converter for macOS and Windows. 1. The MOV to WMV conversion software is embedded with 370+ video and audio codecs, allowing users to convert nearly any video, including 4K UHD, 1080P, 720P, VR videos, for example, video to MP4, MKV to AVI, WMV to MOV, MTS/M2TS to MOV, MP4 to MP3, MOV to FLV, MOV to AVI, WMV to MP4, and more. 2. You can use the MOV to WMV converter to edit video files, trim/crop/add watermark/subtitles, change video resolution, frame rate, video audio bit rate, etc. 3.If you want smaller file size, the program can compress WMV speedily without noticeable quality loss. 4. Plus, the MOV to WMV converting tool can download MOV to WMV from 300+ online sites covering YouTube, Vimeo, Dailymotion. There are also plenty many websites that offer access to free convert MOV to WMV online. The most popular free online MOV to WMV converters include Zamzar, Clipchamp, and OnlineVideoConverter.com. However, it's significant to know the limits to convert MOV to WMV online. To help you make a well-informed decision, we enlist advantages and limits of using online MOV to WMV converters. No need to download desktop MOV to WMV converter. Easy to convert MOV to WMV online free. Some provide video parameter settings. Most websites contain adware, redirects and such likes. Delay in MOV to WMV conversion output. Speed is various from one site to another. 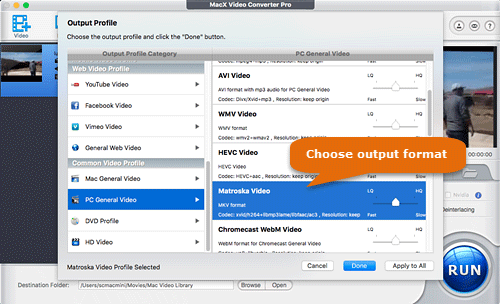 MacX Video Converter Pro is a top-rated MOV to WMV converter for macOS and Windows, which can convert MOV to WMV with good quality, 5x faster speed than free (online) MOV to WMV converter. No size limits, no ads, no extra software.